Our last main stop was in Galway. 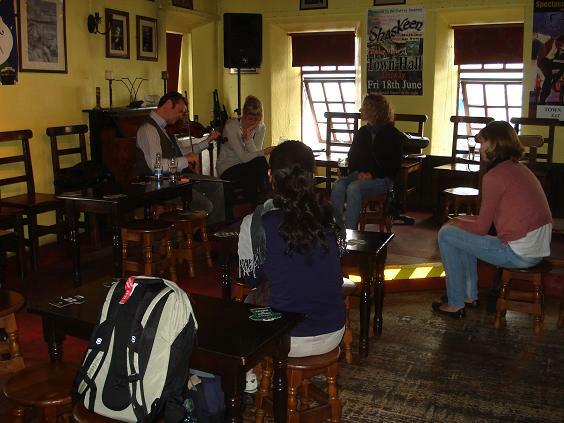 The first day was an early morning jaunt from Dingle to Galway for a series of workshops with John Wynne, Paul Brady and Angelina Carberry at the famous Crane Bar. We all learned a tune together from John before breaking into various groups depending on our instrument of interest. The advanced fiddle players had a great workshop with Paul, who later wowed us with some masterful playing. While the fiddle students were working with Paul and the Flute/Whistle players were with John, Eddie and I worked with Angelina on a 4 part reel which was quite a workout. I’d had the pleasure of taking a class with Angelina at Celtic Week at Swannanoa last year, so it was great to reconnect with her. She brought a tenor guitar which had a lovely sound. Just wish I had been a little more with it. The short sleep the night before coupled with the drive to Galway left too few brain cells. Fortunately, she taught us a couple of flings after the reel. 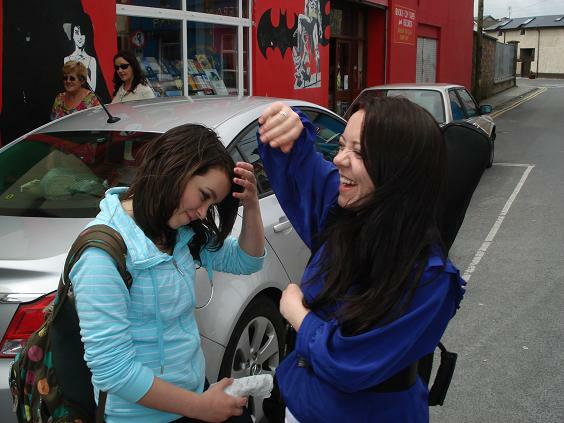 While she was teaching us, her daughter Shaunagh taught Tristan on fiddle. I think they had a great time. Here’s a picture of Angelina and Shaunagh out in front of the Crane. Later in the day we checked in at the SleepZone hostel which was conveniently located a few blocks from city center. We spent most of the rest of the day exploring Galway and listening to some tunes at Cooley’s Pub right in the city center. On Day two, most folks took the ferry out to the Aran Islands which was apparently quite the adventure due to high winds and challenging conditions. However, since Karen and Katherine still weren’t at 100%, we decided to wait a day on the islands. Katherine explored the city more while Karen and I headed off to Connemara which was absolutely stunning. On Day 3, roles reversed and we headed out to Innis Mor, the largest of the Aran Islands, by ferry. You don’t bring your car over on the ferry, so upon arrival, the options for getting around are walking, tour bus, horse cart, or bikes. Since the weather seemed to be cooperating, we decided on the bikes. We biked out the coastal route where the seal colony suns itself and then headed up to Dun Aengus fort, which was spectacular. We had a great tour guide who gave us some of the history of the Island and Fort. She worked on the site as an archeologist, so it was an especially insightful presentation. We arrived back at the main town in time for a bowl of chowder and apple rhubarb pie before taking the ferry back to Galway. Yum! On the last morning, before heading down to Ennis, I ducked into Four Corners Music Shop which had an excellent selection of CDs, instruments, resources and accessories. I only had about 30 minutes, but could have easily spent about two hours in there. I’ll just have to come back to Galway, I guess!